For a company so new, Advanced Sound have produced a shockingly wide product range, almost all of which met with a positive critical reception. I’ve greatly enjoyed all of their products sent my way, from their highly cost-effective 747 and M4 to their pricier, but more distinguished Model 3. The hallmark feature of their past products has always been their value, with all of their models lying below $100 USD. Their all-new Alpha doesn’t maintain a budget status, but it does still represent value in its own regard. The Alpha diverges from Adv’s budget models as a $499 full-sized headphone sporting proprietary single-sided 96mm planar magnetic drivers. That may sound jarring coming from the rest of their lineup, however, it’s fairly modest considering the technology on offer. Chiefly, planar magnetic drivers come with a wealth of inherent benefits; offering more precise transience, lower distortion and a more natural interaction of sound with the outer ear. Moreover, the Alpha represents a surprisingly mature example, excelling with coherence and control. You can read more about the Alpha and purchase a set for yourself here. I would also suggest reading more about orthodynamic/planar magnetic headphones here if you’re not already familiar. I would like to thank Hannah from Advanced Sound very much for her quick communication and for providing me with the Alpha for the purpose of review. All words are my own and there is no monetary incentive for a positive review. Despite receiving the headphones free of cost, I will attempt to be as objective as possible in my evaluation. The Alpha’s packaging reminds of established competitors from Hifiman and Sennheiser. They ship in a large textured box with a metal clasp and lasercut foam innards that snugly protect the headphones and accessories inside. In addition to the Alpha itself, Advanced sound include a lightweight 8-core cable, magnetic leather cable organiser and ¼” adapter. Interestingly, Adv also provide an additional pair of earpads, they’re of a different design to the pre-installed pads offering a slightly altered sound signature. It’s a nice inclusion that will be appreciated by many. I should also mention that the Alpha’s come with an extensive 3-year warranty that will sure to inspire a little extra buyer confidence. 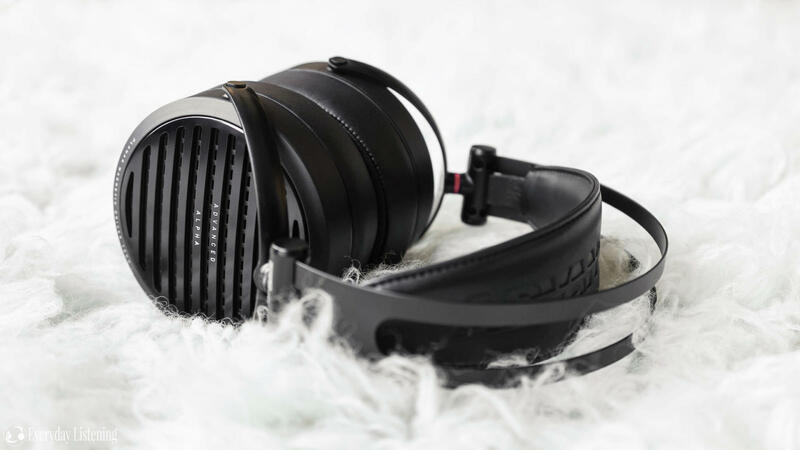 The Alpha is through and through an at-home headphone; with a larger, comfort focussed design and open-back form factor reinforcing this notion. Its construction is very pleasing, perhaps not as sumptuous as some portable fashion cans around this price, but I would compare them favourably to the Sennheiser HD6XX series and Hifiman headphones. It’s a blend of smooth painted aluminium and tactile plastics that present well, a pleasing bled of form and funtion. The headphones aren’t light (380g w/o cable), but they’re inline with other planars such as Hifiman’s HE-400 headphones. Still, they will be noticeably heavier than standard dynamic headphones; for reference, the HD650 is a mere 270g. Regardless, the headphones feel rock solid, with tight tolerances to every join and joint. The hinges don’t squeak and the suspension headband, though slightly firm for me, reliably holds the headphones in place. It has a well-judged pressure that balances stability with adjustability, suiting a wide range of head sizes. The very wide pleather headband effectively spreads the weight of the headphones, avoiding hotspot formation during long listening sessions. The Alpha has fairly high clamp force that will be subject to personal preference. At the very least, this makes them impressively stable on the head despite their size and weight. The earcups themselves also flatter with their quality. Though the frame is plastic, they feel dense and solid, reducing weight without compromising feel. The plastic has a nice texture and finish that feels harder wearing than the scuff prone matte and gloss found on most headphones. Otherwise, all structural elements of the headphones, the hangers, hinges and protective grills, are metal. They’re evenly painted and continue to present well after months of testing. Both included earpads are spacious, soft and comfortable with soft memory foam padding. They provided excellent comfort and seal though the slimmer hybrid pads may be less comfortable for larger eared listeners. They attach via 4 clips that twist into place, enabling very easy swapping. Unlike others, I didn’t experience deterioration of the protective mesh over the drivers. Being an open-back headphone, isolation is minimal and they do leak sound securing them as an at-home headphone. At the bottom, the Alpha interfaces via a dual entry 2.5mm cable, one on each earcup. The plugs are colour coded to match the coloured hinges. The cable itself is fairly pleasing with silver plated innards. It’s very thin, more suitable for an IEM than a full-sized headphone, though it feels nicely constructed with a tight 8-core braid. It’s also quite short at just 1.2m which may not suit those that intend to run the Alpha’s from a desktop setup. Otherwise, the cable is pliable and nicely relieved at all terminations. It has a 3.5mm case friendly straight plug though Adv also include a ¼” adapter in the box. As others have mentioned, it would’ve been nice to see a more substantial cable included in the box or even two cables, one longer cable for desktop use and a shorter portable cable. Still, the included units will be more than adequate for the majority of users.